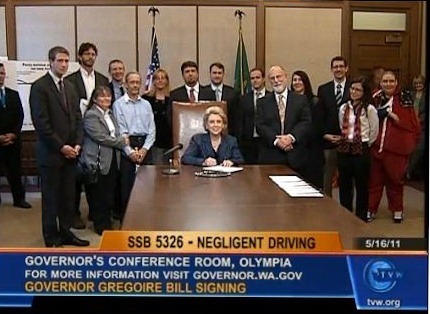 Just got back from a trip down to Olympia today, where Governor Christine Gregoire has signed SB 5326, the Vulnerable User Bill into law. This is the culmination of three years of advocacy work by the Cascade Bicycle Club and others. Having attended three Judiciary Committee hearings, and testified at two – I’m pleased to see this come to fruition. 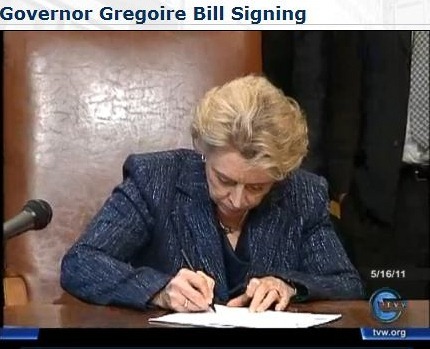 SB 5326 was among the final bills signed from this legislative year. Shortly before four this afternoon, I got to shake the governor’s hand, and to tell her that my family and I appreciate this new law. 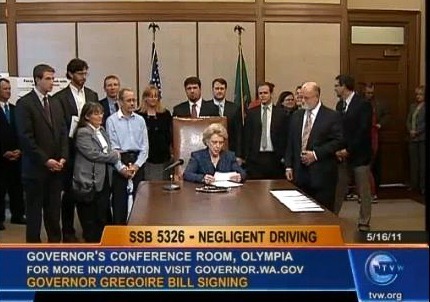 It will go into effect on July 1, 2012, four years to the day after my accident. This experience was valuable for me in a number of ways. First – it’s an education to see the legislative process in action. Definitely not always pretty, but definitely good to understand. Watching the Advocacy folks with Cascade work with the bill sponsors to help navigate the process was interesting. Speaking with my legislators, as well as others about why it’s good to build awareness and accountability into our driving laws, was incredible. Obviously, the opportunity to participate in positive change following my own brush with an inattentive driver was powerful too – good things from bad, and all that. The person I really have to thank for this is my wife Kris. During my recovery back in late 2008, she and I were talking about the motorist vs. cyclist dynamic – how each seems to incite the other endlessly concerning road safety. Kris pointed out that rather than complaining, it’s a far better use of energy to work to change the laws. Naturally when the opportunity to participate arose a couple of months later, I couldn’t pass it up. A bicyclist was killed Wednesday night after colliding with a car on an Aurora Avenue North off-ramp. The man was struck about 10:20 p.m. in the southbound lanes of the Dexter Way North off-ramp. The driver was taken to Harborview Medical Center with minor injuries, Seattle Fire Department spokeswoman Helen Fitzpatrick said. The driver may have been impaired, but police did not offer many details Wednesday night. "The cyclist was traveling southbound on Aurora, as was the vehicle that struck the cyclist," said Detective Mark Jamieson, Seattle Police public information officer. "The vehicle did hit the cyclist from behind." Posted by Carl at 7/2/09 7:12 a.m. Does this prove that cars are unsafe and we’d better ban them? If the bicyclist had hit a light rail train, would it have been light rail’s fault? Posted by thebaldguy at 7/2/09 7:18 a.m.
really the laws need to be changed bicycles do not belong the streets, unless they have their own lane. all streets need a bike lane. until then however they need to stay out of the way!!! … and it goes on. In general, I find reader comments to be useless. They’re usually a combination of trolls, idiots, and relatively few thoughtful comments. In this case, there were some folks that pointed out that perhaps riding a bike along Aurora Ave (a very busy thoroughfare in Seattle) at 10pm might not be the safest thing to do. Definitely a fair question. And there were also folks that complained about bicyclists cutting in front of them, or darting across intersections, etc. Irrelevant in this case. Let’s not lose sight of the fact that when you drive a car, you are responsible for seeing the other vehicles on the road (including bikes), and for using good judgment behind the wheel.